All WIP queue is migrated as it is but on them worker Id set to owning user, so since these were the items in user’s In progress queue in CRM 4.0 they are migrated with working user set as owning user. If you match your queue details with standard CRM 2011 organization (which was not upgrade from CRM 4.0) then you will know that they have got only one named queue and do not have this additional WIP queue. 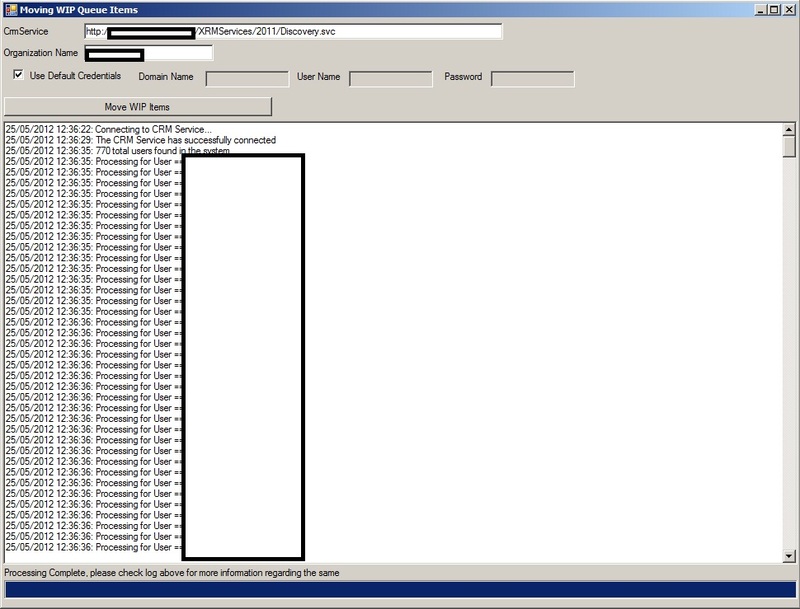 If users want to match up this queue experience for CRM 2011 environment (migrated from CRM 4.0 system) to new install of CRM 2011 environment then following ate recommended steps for the sae which are mentioned in following article. this article provides the details but does not provide tool or script to do the job, this post will provide tool and script code to achieve this. Now each user can manually do above task but if you got large user base then I guess it is better if system admin can do above task for the same. I have created application which will move all current WIP queue item to user’s named queue and then disables the WIP queue. 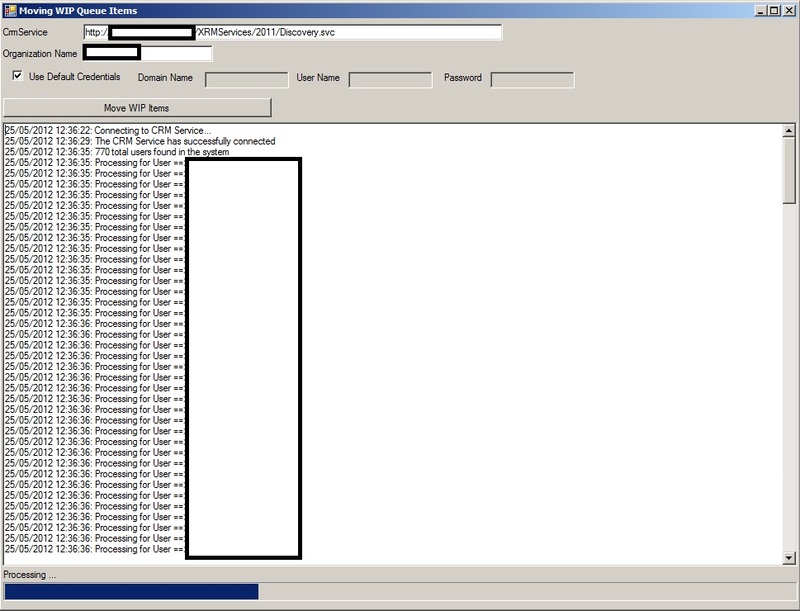 Step 1: after downloading CRM2011_WIPQueues_Upgrades_EXE.zip,extract the zip file. Step 3: provide CRM server details and then click on “Move Items“ button. Following are example screen print for the same. One advantage of this application is it is supported but disadvantage is that it could take more then 2-3 hours if your CRM system got really large records in WIP queues but since we have run this only once I prefer this approach. However there is another faster (but unsupported) method is mentioned below to achieve the same result. 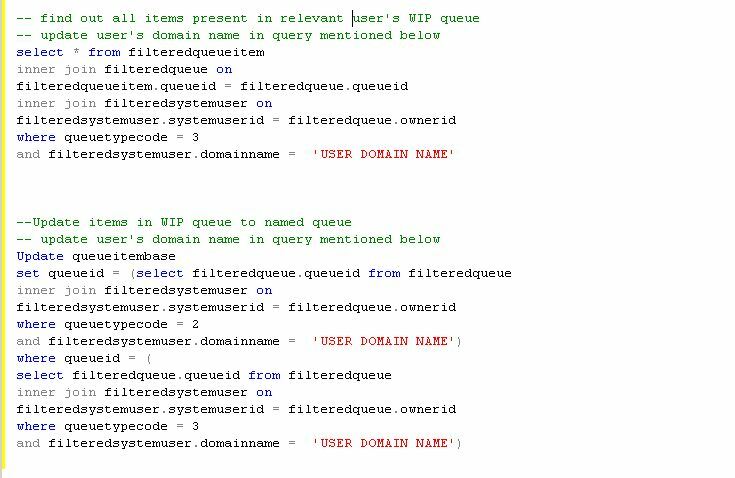 System administrator can build SQL script to update all relevant queue item records to change queue id from WIP queue to user’s named queue. Following example screen print for the script for the same for one user, this script can be downloaded from here and change the USER DOMAIN NAME for the relevant user in the following script. Of course this needs to be run for all users in the system. One advantage of this approach is that it will complete the moving with few minutes even if million records needs moving but big disadvantage is that we are making change to SQL directly which is considered as *UNSUPPORTED CHANGE * so if you are going for this route make sure you test this script fully on your development/UAT environment thoroughly before running them in to Live environment. This entry was posted in CRM 2011 and tagged CRM tool, SQL, Unsupported on May 25, 2012 by mayankp. Hi, the “https://mayankp.files.wordpress.com/2012/05/crm2011_wipqueues.doc” file appears to be down. Is there any chance you could re-upload it? Thanks! Please access the file from following location. can any one provide the files as it looks links are broken? I have also updated links in to above blog article..